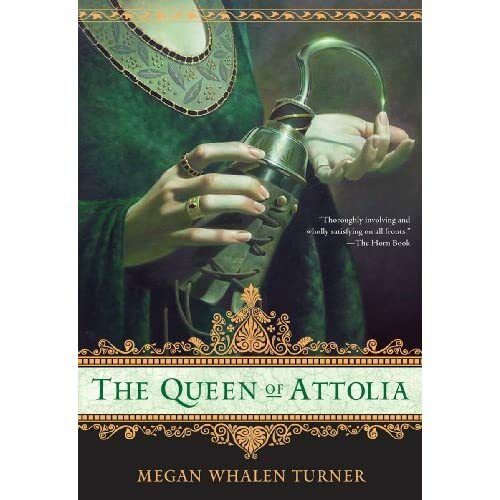 When reviewing this series’ previous book, King of Attolia, I commented that I was impressed Megan Whelan Turner didn’t just churn out books similar to The Thief but instead kept developing her characters and taking them to new places. She does that again in the series’ fourth book, Conspiracy of Kings, but also takes the even bolder step of demoting Eugenides into a supporting role and making Sophos the main character. I suppose it would be easy to overstate the risk here, since the series has acquired most of its fans not through Eugenides’ particular traits but instead through Turner’s depth of characterization, and that is definitely on display once again. Like many fantasy protagonists, Sophos has an interest in books instead of fighting and horseback riding and thus is a disappointment to his father. Unfortunately for his hopes of living a quiet life, he finds himself tangled in the schemes of barons hoping to replace the King of Sounis with a puppet they can control. Since Sophos doesn’t have the physical gifts Eugenides’ does, he’s a more thoughtful adventurer, enduring hardship but wondering as he does whether his goals justify his sacrifices. His friendship with Eugenides is his one chance of coming out on top of the situation, but they have to figure out how to position their friendship against the needs of their respective countries first. If I had to criticize the book, it would probably be for the way it feels “small” despite a reasonably epic storyline. Sophos meets a number of people in his adventures, but it seems like his only lasting acquaintances are the royalty of Eddis and Attolia. The same is true for those monarchs as well…they seem to know each other far better than they know anyone in their actual countries. However, in a genre usually featuring sprawling casts and overcomplicated stories (adult fantasy that is), the economy on display in Turner’s books is a little refreshing. Maybe I should read more YA fantasy. Anyone who enjoyed the previous three books in the series will like this one too. It’s a much more straightforward novel than King of Attolia, but it still handles its central character conflict with an impressive degree of subtlety. I feel like the interactions between Sophos and Eugenides would have gone straight over my head when I was reading YA books, but perhaps I’m selling kids short. Readers new to the series should start with The Thief. I frequently wish fantasy authors would write more standalone books and less one story, multi-book series, but my experience with Megan Whelan Turner’s books suggest they know what they’re doing. After reading and really enjoying The Queen of Attolia, I just kind of didn’t get around to reading the sequel for months. A chapter into it, I was wondering why on earth I had waited so long, because I was enjoying The King of Attolia far more than most of the books I’d read in between. This is the third book in the series, so readers know pretty much everything about the main character, the retired (sort of) thief Eugenides, when they start. Unlike Queen of Attolia where his motives for most of the book were purposefully obscured, in King it’s pretty obvious to the reader what Eugenides is up to. Turner wisely tells the story almost entirely from the perspective of characters who don’t know him. I strongly dislike books whose viewpoint characters spend most of the plot doing what the reader knows are dreadfully stupid things, but here the viewpoint characters are reasonable people so the device works beautifully. Of course, when considered dispassionately, Eugenides is basically a superhero, able to sneak around like a ninja but also fight even the most experienced warriors to a standstill in a straight-up fight. He’s still fun to read about, partly because of the quality of characterization, but also because Turner doesn’t bother trying to make the reader wonder if he’s going to win. Instead, she lets us wonder just how much collateral damage will be done before he gets what he wants. Like Dorothy Dunnett’s somewhat similar heroes Lymond and Nicholas (although not to their extremes), Eugenides is a dangerous person when under pressure, both to those around him and himself. It would have been easy for Turner to have started churning out copycat Eugenides books after The Thief was a success. Well, maybe not easy, but certainly easier than what she’s been doing. The second and third books of the series have both challenged Eugenides and forced him to mature, and Turner resisted the temptation to hit emotional reset buttons, unlike so many authors (not to mention screenwriters, since serial TV is a big offender here too). Readers new to the series should definitely start with The Thief. Theoretically this is all YA, but if it wasn’t for the length (a nice change in itself from the multibook epics) I probably wouldn’t have noticed if not told. I definitely recommend the series for fantasy readers be they young adults (whatever that is) or actual adults. This is a sequel to The Thief, a traditional sequel in that it’s not a continuation of the first book’s story but rather a separate story involving the same characters that takes place afterward. Like the first book, this is a secondary-world fantasy that is light on actual fantastic elements (though they are not totally absent). Also as before, the world takes its names from Ancient Greece, its society from medieval Europe, and its politics from both, though the author provides a strangely defensive afterword claiming there’s no connection to actual history. Although Eugenides, the titular thief from the first book, is still the most prominent character, he no longer narrates and the book’s story involves very little, well, theft. Instead the focus is on political intrigue and the struggles in war and diplomacy between three kingdoms, with Eugenides serving as a spy-commando like a medieval James Bond. The book was recommended to me as “a YA version of Dorothy Dunnett” and there’s a lot of truth to this. Like Dunnett’s Lymond and Nicholas, both Eugenides and the Queen for whom the book is named embark on elaborate schemes that depend on deception and much of the fun of reading the book comes from watching these schemes play out. It also shares some of the weaknesses of Dunnett’s format: to preserve suspense in the face of ultra-capable characters, the reader is frequently left in the dark about their true plans and even sometimes their motives. This was a big part of The Thief too, but it’s more disruptive here because it’s the characters’ feelings about each other that are being obfuscated in service to the narrative. Having to show the cause of the main character’s romantic attachment long after showing its effects strikes me as inherently less effective, since the whole thing seems to come out of nowhere. However, if it shares the weaknesses of Dunnett’s series, it also shares many of their strengths, and if it’s not as literate and ambitious, well, it’s a lot more accessible. Unlike The Thief, which struck me as pretty much a straight adventure, Queen of Attolia also asks some thought-provoking questions…classic Greek questions, in fact, about fate and free will (and, in keeping with its setting, the book seems to point toward medieval European answers). As always with YA books, I can’t tell you what actual young adults will think, but it’s definitely a worthwhile read for adults. Picking up a copy of the YA fantasy novel The Thief that promised “bonus content” in the form of, among other things, an interview with the author, I flipped to that section. When she was asked what other books she would suggest for her readers, I expected her to mention some current YA and perhaps something older like the Prydain books. She did mention some along those lines (Diana Wynne Jones for instance, if I remember correctly), but her first suggestion was Thucydides and his History of the Peloponnesian War. If there’s a better anecdote demonstrating the modern YA respect for its readers, I haven’t heard it yet. The funny thing is, it turns out The Thief is not at all a demanding book, maybe even by YA standards (though I admit I’m not widely read when it comes to YA). Narrated in an irreverent first person by the titular thief, it describes how the protagonist is dragooned into an expedition to retrieve a long-lost artifact. This artifact is rumored to have magical powers, but its real importance is as a means to legitimize the monarch of one of a handful of small, squabbling kingdoms. Some of the cultural details of the kingdoms are based on ancient Greek culture (hence the connection to Thucydides) but most of the important elements (monarchies, dungeons, weapons) are bog-standard medieval. Most of the narrative is spent outside of the cities, in any case. The narrative has a couple of reversals of varying degrees of cleverness, but really this is a very simple novel: relatively short, maybe a half-dozen characters, and no real thematic complexity. Some of the twists towards the end rely on the narrator withholding information, and while I don’t think that’s cheating, it obscures his character to some extent. However, the execution of all this material is excellent, and while I would prefer more complexity, the sequel (which I’m currently reading) takes the characters in some very interesting directions. Recommended particularly for YA readers, but any fantasy fan will enjoy it.